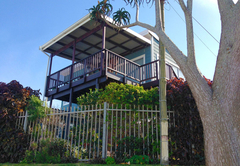 Ocean Dreams B&B is a highly recommended B&B with self catering option, providing accommodation in East London for tourists visiting the Sunshine Coast region. 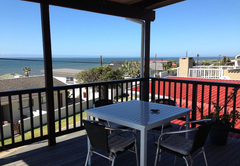 Ocean Dreams is situated just 300 metres from Gonubie's unspoilt pristine beach, golf course and boardwalk. The city is a short 15 minute drive away. There is a convenience mall with a gym less than 500 metres away and a shopping complex with restaurants and entertainment within two kilometres. 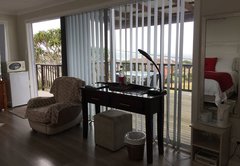 Luxury accommodation with a Sea View, this room with an air-conditioner is ideal for couples, or anyone wanting to really spoil themselves. 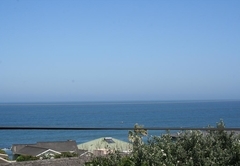 A 360 degree view of the sea allows for watching dolphins play in the sea from own private deck. You can also have this magnificent view from the inside of the bedroom while relaxing in the sitting area which has a three seater & single seater sofa. You will be spoiled for choice with Premium DSTV on a 42” flat screen TV, while enjoying the honesty snack basket and mini bar. 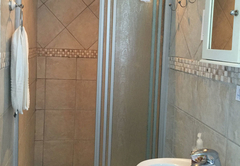 If all of that isn’t enough then take a well deserved pamper session in the luxurious en-suite bathroom. The huge bathtub invites you to linger even longer while enjoying the sea view. The shower is huge with a rain style shower-head. Also available is a hairdryer and electric blanket to warm you on those cold nights. A spacious luxury bedroom with a Queen size top of the range Simmons bed. Our linen is of the highest quality, 100% cotton percale as well as block-out lining on our window dressing to ensure a peaceful and restful sleep. Huge cupboard space especially for guests planning to stay longer. A two seater and single armchair. Enjoy selected DSTV channels on a 42” flat screen TV while sipping on tea / coffee provided, or relax with a choice from our honesty bar. 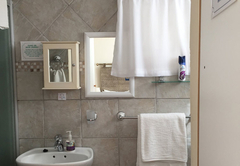 Enjoy a bubble bath or refreshing shower with lovely toiletries provided in an en-suite bathroom. 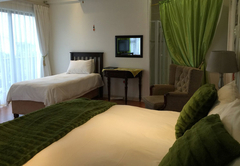 The spacious Green Room with a private entrance is the most convenient for anyone needing an extra bed. Block-out lining on our window dressings is perfect for a sleep in. An extra bed is provided if perhaps extra sleeping space is required. The single armchair gives you a perfect space to snuggle with a book or enjoy one of our selected DSTV channels. 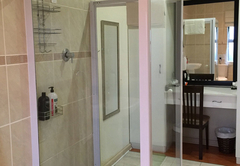 Refresh yourself with a lovely shower and scented toiletries in the en-suite bathroom. 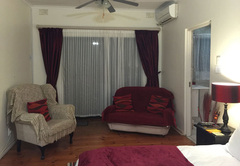 In addition to these facilities, to ensure your stay is pleasant & comfortable, is an air-conditioner, ironing board with iron, ceiling fan, hairdryer, electric blanket and umbrella. 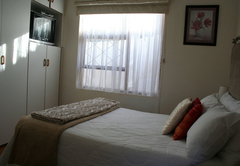 Our 2 bedroom unit is cozy & comfortable. 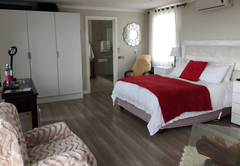 Both bedrooms have their own en-suite shower and is perfect for either a family or guests wanting to have access to their own lounging area & kitchen. 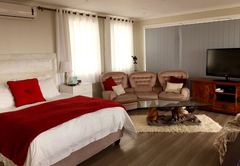 The bedrooms also have their own TV, selected DSTV channels with separate viewing for each room, hairdryers & a digital safe in one of the rooms. The fully equipped kitchen has a hob and an under counter oven, fridge, microwave, toaster, kettle, snackwich maker, and all necessary utensils. Granite counter tops make this kitchen a pleasure to cook in. The open plan lounge has a double sleeper couch & huge sofa. Relax & watch TV together in the lounge on the 32” flat screen TV. 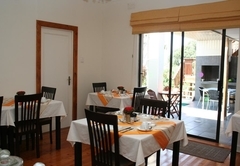 Braai & weber facilities are on the lovely patio where guests can relax & socialise. 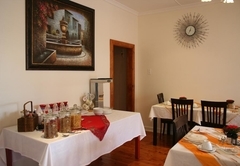 Our delicious hot breakfast can be enjoyed in the tastefully decorated dining room. In addition, we also serve a selection of cereals, yoghurt, jams, cheese, juice and tea / coffee. There are many restaurants nearby or takeaways for dinner options, and we are happy to make dinner reservations for guests at a restaurant of their choice. Braai facilities are available on the premises and we will gladly supply guests with all utensils. Please note we are Halaal compliant, and all utensils used as well as preparation dishes (pots, pans, etc), are completely separate for our Halaal guests. Secure off-street parking is available. 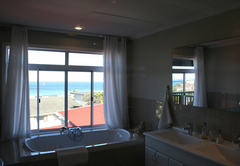 Situated upstairs with a stunning 360 degree view of the sea. A private deck to relax. 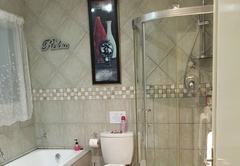 The spacious room has a sitting area, Premium DSTV, a medically approved massage chair, 42" Flat TV screen, honesty bar fridge, microwave and a stunning bathroom with huge bath & shower. 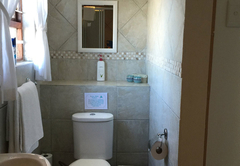 Facilities also include an air conditioner, tea/coffee & toiletries. This room could definitely be considered as a honeymoon suite. 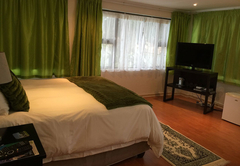 A beautiful spacious bedroom with cool fresh green decor. This room has a queen size pillow top bed and an armchair to relax in. 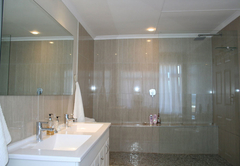 An en-suite bathroom with Shower and toiletries. 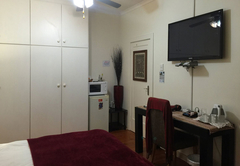 Room comes complete with DSTV, bar fridge, microwave, ceiling fan, air conditioner, hairdryer, iron & ironing board, electric blanket, tea/coffee facilities and has a private entrance. For convenience if a third person (adult / child) needed to share there is an additional Single bed in the room at an additional cost. 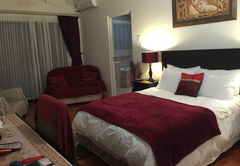 Luxury, spacious bedroom decorated with rich burgundy tones. Queen size bed and comfy chairs with a view of the sea off the private entrance. Large cupboard space. 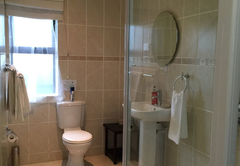 Spacious en-suite bathroom with bath & shower. 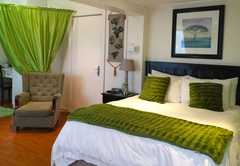 Facilities in the room include, toiletries, hairdryer, ceiling fan, air conditioner, DSTV and 42 inch flat screen TV, bar fridge, microwave, tea & coffee facilities, electric blanket, hairdryer, iron & ironing board, WiFi & safe all available. 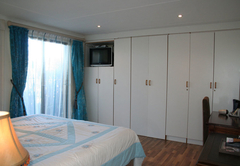 The self catering unit consists of two bedrooms. 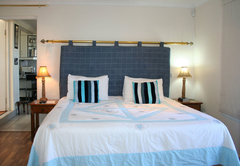 The Blue room has a King size bed which can be converted to comfortable twin beds & en-suite shower. A private entrance leads out to our wooden patio. Room comes complete with DSTV, hairdryer, toiletries & electric blanket. The second room known as the Cherry Room sleeps two. 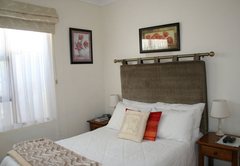 This cozy room has a double bed & en-suite shower. Room is complete with DSTV, digital safe, hairdryer & toiletries. 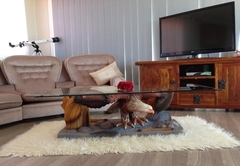 This unit has a fully equipped kitchen & lounge with a double sleeper couch & huge sofa. 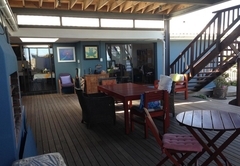 The lounge leads on to our wooden patio area with braai facilities. We loved our stay at Ocean Dreams this is really a home away from home. The owners treated us like family and was a sad day when our stay there came to an end. Would like to say thank you for a wonderful stay and a fantastic time had. Child policyChildren of all ages are welcome in the Self Catering unit(s) and children 10 years and older are welcome in the Bed & Breakfast unit(s).